Read this prayer devotionally, and experience the difference ! This is a Miraculous Image and NOVENA Prayer of INFANT JESUS, used by thousands of devotees. 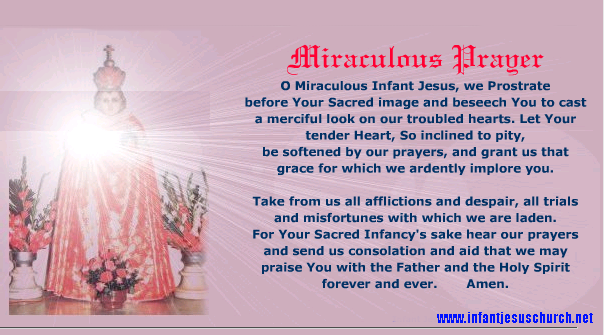 The Image and Prayer used here is from Infant Jesus Shrine / Church, Viveknagar, BANGALORE, INDIA. This flash file (prayer) can be download click here (if not downloading, click mouse right button, and click on "SAVE AS". Very good blog. All in one... Thanks Binoti Basumatary, and keep it up.... May the Infant Lord Bless you. Can I download this prayer? Yes, Sobita you can download this flash file from below given link: copy and paste to the address bar or right click say save as. Infant Jesus, your a major part of my Life.I Thank you for being with me always by guiding me and helping me out in every possible way.. I may have forgotten you during my happy times but you never gave up on me. Praise you Infant Jesus, Love you Infant Jesus. Very Good blog for devotees . Praise you infant Jesus.